Centrosaurus was about 20 feet (6 meters) long, and had a single horn on the center of its nose. The nose horn would curve backwards or forward depending on the particular species of Centrosaurus. Lawrence Lambe discovered the first fossils of Centrosaurus in Alberta, Canada. Lambe was also the person who coined the name Centrosaurus, which he did in 1904. Lambe found fossil beds containing hundreds of individuals in close proximity. It is thought perhaps that these animals died while trying to cross a river, and these fossil beds also suggest that Centrosaurus probably lived in large herds. North American Dinosaurs - Centrosaurus lived in North America. Centrosaurus was a genus of dinosaur. "Centrosaurus" means "prickle lizard" (after the small hornlets on the neck frill, and not the horn on the animal's snout). This name was chosen by Lawrence Lambe in 1903. Centrosaurus was a member of the Ornithischia ("bird-hipped") order of dinosaurs. What this means, is that although Centrosaurus was not closely related to birds, it did have similarly shaped pelvic bones. Centrosaurus was a Ceratopsian - a member of a group of related herbivorous (plant-eating) dinosaurs with beaks, many of which had neck frills and horns as well. Centrosaurus lived between about 75 million years ago and 70 million years ago, during the late Cretaceous period. 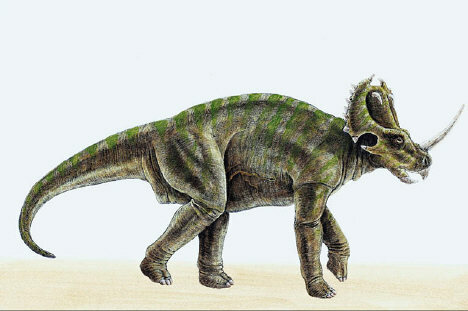 Centrosaurus was a herbivore (plant-eater). Centrosaurus was about 20 feet (6.1 meters) long. Centrosaurus weighed about 1 ton.